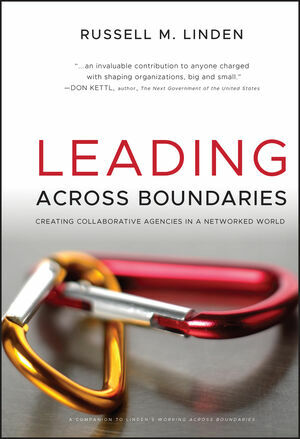 "Leading Across Boundaries is a terrific resource for nonprofit leaders. It is filled with great stories of collaboration, and also with the how-to's to make them work!" "Linden illustrates the importance of collaboration, but drives further into issues of networks to teach us valuable lessons about core interests, trust, leadership, and success. This book is a very valuable and timely resource for practitioners who seek to produce more value from effective collaboration." "Linden provides a fresh, practitioner-oriented perspective on the topic of collaboration–especially for those in the public and nonprofit sectors wanting to benefit from Web 2.0 and social-networking technologies. It's a gem of a book and a terrific road map for leading change." "Linden uses fabulous examples to illustrate the essential ideas for collaboration and for effective leadership. His discussions of political acumen and the interpersonal side of collaboration are especially enlightening. I've been a manager for a long time, and wish I'd read this book earlier in my career!" "Trust, transparency, and relationships are keys to successful collaboration. Linden takes these concepts and more and constructs a masterful lesson plan for us to follow." Russell M. Linden is a management consultant and adjunct faculty member at the University of Virginia, the University of Maryland, and the Federal Executive Institute. He specializes in organizational change and has more than 30 years of experience helping government, nonprofit, and private-sector organizations develop leadership, foster innovation, and improve organizational performance. He is the author of Working Across Boundaries and Seamless Government. Part 1. Creating the Foundations of Collaboration. 1. The Promise, and Challenge, of Leading in a Networked World. The consequences of poor and of strong collaboration, the reasons why we need to surmount our individualistic natures and fragmented agencies, and ways to meet both me and we needs. 2. AGEP: A Collaborative Project That’s Making a Big Difference. The example of a leader who developed and managed a collaborative project in which universities formed an alliance to significantly increase minority enrollment in graduate programs. 3. A Framework for Collaboration. The structure of collaboration, and key factors that form the foundation of success. 4. The Power of Relationships Built on Trust. Why trust is the glue in most successful collaborative projects, and strategies for creating trust. 5. The Art of Collaborative Leadership. The five characteristics of collaborative leaders, and the story of a successful effort to rejuvenate an old industrial city. Part 2. Getting Started: Dealing with Process and People Issues. 6. Getting the Collaborative Process Started. The steps for creating collaborative teams, and the story of how an alliance supporting small businesses got off to a great start. 7. Getting Commitment on a Common Direction. Methods for getting a collaborative team to agree on goals and strategies, and the example of an unlikely partnership among tobacco growers and public health advocates. 8. Working Effectively Across Different Cultures. Ways of dealing with different values, norms, and procedures, and the inspiring example of Israeli Jews and Arabs who are doing just that. 9. Dealing with People Problems in Collaboration. A methodology for anticipating and coping with difficult people and situations, and two cases studies of virtual collaboration in the intelligence community. Lessons from financial agency leaders who created successful collaboration in the toughest of cultures. Part 3. Developing Sustainable Collaborative Cultures. 11. Co-Locating Operations: Using Shared Space to Foster Information Sharing and a Culture of Collaboration. Three examples from nonprofit and government agencies that demonstrate both the collaboration benefits from co-location and some critical success factors and issues. 12. Using CompStat: A Structured Method for Generating Collaboration and Accountability. Washington State's adaptation of the CompStat method pioneered by the New York City Police Department, a method that generates collaboration on high priorities and makes a difference in people's lives. 13. Using the New Web to Help Stakeholders Collaborate in Value Creation. 14. Developing the Leadership to Create Tomorrow's Collaborative Cultures. Lessons from Cisco Systems' transformation to a decentralized culture that rewards collaboration, how the Millennial Generation can transform your agency, and how collaborative leaders develop and foster a collaborative mindset to make a difference. Resource A: Create Your Own Game Plan. Resource B: Country Rankings on Five Cultural Factors.